Whatever you’re doing today, it’s about to become more fun. Yamaha Personal Transportation Vehicles make the perfect addition to the family. Their exceptional gas mileage makes them ideal for transporting guests, hauling the family or running the occasional errand. Add on a radio with speakers, floor mats, a rear facing seat or any other number of Genuine Yamaha Accessories and equip your Personal Transportation Vehicle for the way you use it. Yamaha offers six 8V or eight 6V battery configurations to best fit your needs. 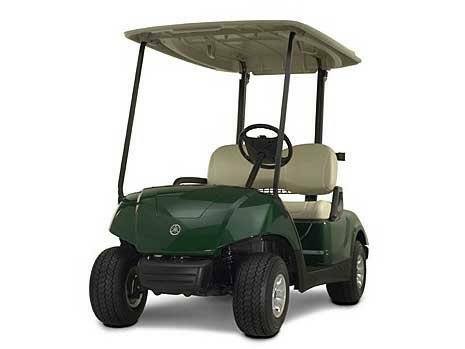 The standard six 8V configuration provides dependable power that is less expensive to maintain. 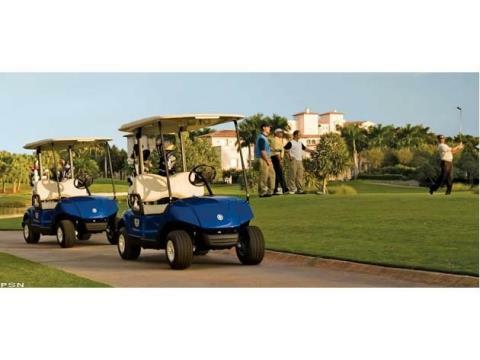 For courses that need extra range or for private car customers living in golf car communities that use their car to travel about town, the eight 6V configuration provides as much as 33 percent more range. The auto industry spent a hundred years getting this right, so why not use it? We gave it four cupholders to hold different-size cups; a center storage area for wallets, cell phones, and personal items; six ball holders; six tee holders; and a big, easy-to-clean storage compartment on each side. You know and we know: things happen out there. So we made our bumpers with thicker walls and textured surfaces to withstand mishaps. They're the same height front and rear to minimize damage. They release air on impact; in fact, they're 5 mph rated. And if worse comes to worst, you can replace them by removing only two bolts. Best window of entry and exit. Best leg space in the industry. Best foot space, rear body to pedal. Improved steering height and position. Improved seat height and position. Improved headroom. There's no better space to occupy, take our word for it. Our cast-aluminum transaxle case is designed with integrated impact protection. You don't need a skid plate to fend off the hazards that come from underneath. Our hardened case can take care of itself. Our top is wider and extends farther in the front for maximum occupant protection, and it's longer in the rear to give maximum protection without interfering with the clubs. It has the only 360° double rain channel in the industry, and its integrated water drain system has an exclusive clog-proof design. It's built for rattle-free stability and has integrated grab handles. So who's afraid of a little rain? It's not just that it's thick, contoured and textured for easy gripping. It's not even that we integrated a scorecard holder and a pencil holder into the design. It's the way we carefully positioned the pencil holder to avoid scratched wrists and torn golf gloves. That's what we mean by attention to detail. You know that really gross stuff that collects in the bottom of cupholders? We don't have that. Our cupholders are built with drain holes that keep liquids and debris from accumulating. And they're removable, so cleaning them is a snap. The point was to make it easy to clean. So we made it one piece, covering the floorboard and footrest area. We made it from durable, textured rubber to provide cushioned comfort for the occupants. By arranging the batteries in a straight line, we simplified the wiring and connections, we reduced the number of hold-downs, and we made watering and maintenance easier. Such a simple thing. Why hasn't anybody else thought of it? An industry first, inspired by the Yamaha ATV. A completely enclosed disc brake system that eliminates brake drums and shoes, needs only one brake cable, and is projected, based on extensive testing, to have an incredibly long life with essentially no maintenance. Sealed bearings, automotive grade tie-rods and permanently lubricated steering components that never need greasing save you time and money. That's smart design. How do you make a chassis nearly 20 percent lighter and 2.5 times stronger? We mated an automotive, ladder-style, 100 percent robotically welded steel frame, protected by an 18-step paint process, to a polypropylene structural floor. Its unique design provides added strength and protects the batteries and electrical connections. Exactly how important is an armrest? Depends on whether it's done right. Ours is strong, made of steel-reinforced, glass filled polypropylene. It's larger and wider than previous models, but it doesn't interfere with entry or exit. It's substantial enough to provide comfort and security for the occupants — and if that's not important, what is? It's the biggest bag holder in the industry, but it has an especially low load-unload height and a wide, easy-to-use strap clip to hold two tournament-size bags securely in place while protecting body panels from scratches. It's made of textured, scuff-resistant plastic and has a center divider to help keep bags from shifting. Top it all off with built-in drainage holes to keep bags dry and make cleaning easy. Deep, supportive contours are intended to help hold occupants in place while the car is moving. Designed to accommodate occupants of all different heights and sizes, it's made of pure, supple foam bonded to a seamless, fabric-backed vinyl cover, and the polypropylene seat base is strengthened with plated steel inserts. Won't sag or warp, stands up to repeated pressure washings, and remains the most comfortable seat in the business despite daily abuse. If you need to access the starter generator, governor and transaxle on the gas car, or the motor control unit and vital electrical components on the electric car, you have the advantage of the largest access panel in the business. Open it up and make it happen. It's 39 percent larger than our previous sweater basket, formed of heavy-gauge, vinyl-coated wire that won't rust or corrode and won't snag sweaters. It's designed to be easily cleaned and won't collect dirt or debris. And it comes with an integrated sand rake holder, standard. Who would have thought a sweater basket could generate so much excitement? Someone who cares about his sweater, that's who. You're about maintaining the course, not the car. So this one boasts the lowest cost of ownership in the industry. The lowest. Period. Inner fenders and splash guards are made of one-piece seamless plastic and are designed to keep mechanical and electrical components from getting wet. The rear wells include integrated mud flaps to keep occupants and golf bags from being splashed on. Manufactured by Hitachi, our electric motor is high quality, highly efficient, whisper quiet, and at 3.5 horsepower is one of the most powerful in the industry. Its internal components are nickel plated and stainless steel for corrosion resistance, and it even has its own internal solid-state tachometer. Check out the tread pattern on our four-ply tires. 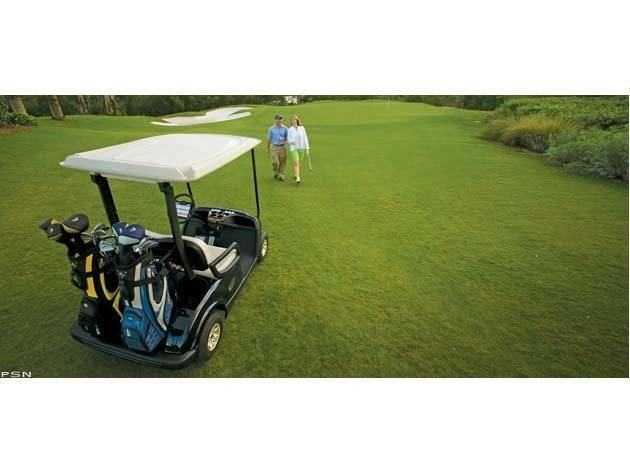 It's designed to provide superior on-course performance while minimizing turf compaction, the perfect combination. How could we dream of powering our car with anything less than the most reliable, longest-lasting batteries in the industry? The DRIVE® comes with 360° protection against scrapes, scratches, and bumps. Polypropylene side sills protect against side impacts. In the front and rear, energy-absorbing bumpers release air on impact to protect the body and frame while tires fill in the gaps. Hazards can approach from any angle. You're covered. It extends battery life and rounds per charge by converting the motor into a generator to recharge the battery while the car proceeds at a regulated speed down hills, slowly and safely. If the parking brake is not properly engaged, the car will slowly inch its way downhill while it sounds and audible alarm to notify you and let you catch it. Notice how one tire stays firmly planted, even though the other adjusts to the terrain? That's the fully independent suspension at work. We designed a maintenance-free suspension using automotive-style, coil-over-shock struts to minimize roll and deliver a smooth, comfortable ride. Sooner or later, some golfer will offer to trade his car for it. We're the only manufacturer&nbsp;that designs and builds our own charger. Weighing in at just over 10 lbs., it's compact and light, uses less power out of the wall, and doesn't hum. Its solid-state Field Effect Transistor (FET) design is completely electronic, not transformer-based like traditional chargers. It communicates and stores charging information with The Drive® motor control unit, and it won't overcharge. If we're going to be the only manufacturer building our own motor control unit, then we figured we might as well make ours the most advanced in the industry. It communicates with the battery charger — also Yamaha built — and with the Yamaha Genius2™ diagnostic and programming system. 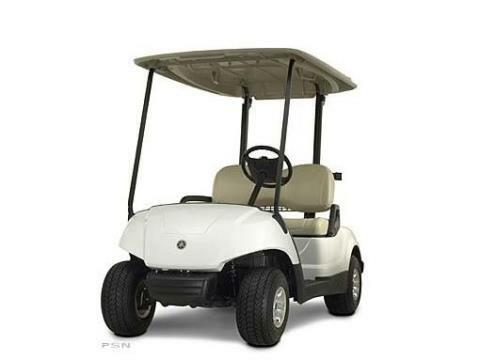 Its roll away protection feature slows it down and lets you know if the brake isn't properly engaged, it ensures smooth starts to avoid turf damage, and its solid-state electronics include a microprocessor with high-efficiency switching. 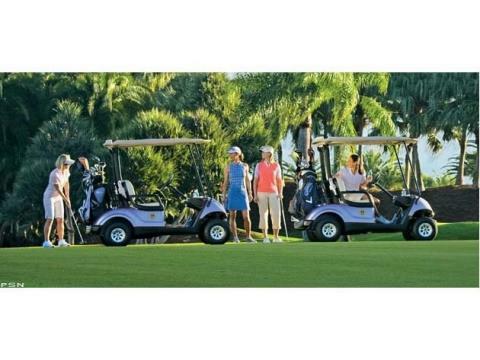 Golf cars don't come any smarter. HybriCore™ Chassis features a robotic welded automotive ladder-style steel frame mated to polypropylene structural floor. Frame is protected with a multi-step full-immersion phosphate treatment, electro-deposition epoxy-based coating, and an electrostatic applied polyester / urethane powder topcoat.